Charlie Chan is in New York sitting in on the sentencing of killer Steve McBirney who was convicted on evidence uncovered by the detective. McBirney is sentenced to be executed at Sing Sing Prison on December 8, prompting the killer to coldly state that he won't have to buy any Christmas gifts. 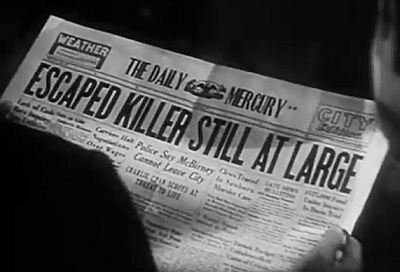 After McBirney is led out of the courtroom, shots are heard, and, as an officer announces that the prisoner is shooting his way out, he escapes with the help of Grenock, his henchman. Dr. Cream, a plastic surgeon who operates a wax museum featuring figures of infamous criminals as a front for his real business of altering the faces of fugitive criminals. McBirney has gone to Dr. Cream for plastic surgery, and, as he recovers from the operation, is lying low until the heat dies down. McBirney, intent on getting his revenge against Charlie Chan, coerces the doctor into luring the detective to the wax museum on the pretense of participating in a crime solving radio broadcast, the subject of which would be the Joe Rocke case, a case which Chan was quite familiar. Although suspicious of Cream's real motives, Chan accepts the invitation, partially because Jimmy, who is now taking law classes in New York, had announced in class that his Pop would be appearing on the broadcast. Chan also suspects that, with Dr. Cream's suspicious background combined with his skills as a plastic surgeon, that a visit to the wax museum might reveal a connection with the fugitive McBirney. As the broadcast at Dr. Cream's Museum of Crime is about to begin, Chan is unaware that he is to be electrocuted as he sits in one of the chairs around a table. However, at the last moment, Chan changes seats with Dr. Otto von Brom, another crime expert who had been instrumental in the conviction and subsequent execution of Joe Rocke for a murder he did not commit. Suddenly, the lights go out and a small fire sparks behind von Brom's chair, who, moments later, slumps to the table, dead. The weapon proves not to have been electricity, but a poison dart that was blown at him by someone, clues reveal, who had been seated at the table. The occupants of the museum are not able to call the police because the phone has been rendered out of order, and, until Chan can contact the police, everyone present is kept inside the museum. Returning to one of the displays that Jimmy had earlier seen to be suspicious, Chan discovers a trap door that leads to a secret chamber below which turns out to be Dr. Cream's operating room. The detective notes clues revealing that McBirney had been there recently. Chan also declares that the method used to kill Dr. von Brom points to "Butcher" Dagan, who was once an associate of McBirney, and who was supposedly dead. Dagan, who has had his facial features altered by Dr. Cream, kills McBirney and tries to kill Chan as well. Inspector O'Matthews arrives on the scene with his men, and then, using a pre-arranged trick, Chan unmasks radio broadcaster Tom Agnew as "Butcher" Dagan. NOTES: According to David Robert Cellitti, the wax figure of Charlie Chan (and, perhaps we may assume that the rest of the wax figures used in the film) was made by a studio in Los Angeles called The Stubergh's, which was run by Katherine Stubergh. "The late Katherine Stubergh was my mentor. She supplied wax figures for such films as House of Wax, Abbott and Costello Meet Frankenstein, The Frozen Ghost and many other films...including Charlie Chan at the Wax Museum." Conviction of most dangerous public enemy bring more peaceful sleep. Always prefer to utilize element of surprise, never to be victim. Only very foolish mouse make nest in cat's ear. Any powder that kills flea is good powder. Knowledge only gained through curiosity. Mice only play when cat supposed to be in bed. Old solution sometimes like ancient egg. Justice can be brought to dead men. Truth speak from any chair. Every bird seek its own tree, never tree the bird. Suspicion is only toy of fools. Sometimes better to see and not tell. Mock insanity not always safe alibi. Justice, like virtue, brings its own reward. As a horrible example of what can happen to series pictures if they're continued indefinitely, 'Charlie Chan at the Wax Museum' has a certain interest. But it has little other value. If, as reported, this is the last of the series, it's neither surprising nor regrettable. For the picture is a feeble effort which should get playing time only on the strength of its probable series audience. Nothing much is to be said of the story, except that it follows the obvious slant indicated at the title. There's a hodge-podge of action in the wax museum as the pigeon-English hero (what ever happened to that amusing dialog that Earl Derr Biggers originally created for the character?) strolls comfortably among villainous facial surgeons and their molls, escaped murderers, imbecile janitors, avenging widows, suspicious lawyers, radio announcers and engineers and a pulp mag version of a girl reporter. There are wax figures all over the place and before long even the scripters seem to have been unable to distinguish between them and the real characters, or between their scenario and the remnants of a plot lying around a cutting room floor. It's all flimsy, muddled, absurd and never for an instant believable. But frequently it's just preposterous enough to be amusing. Sydney Toler repeats his standard portrayal of Chan, while C. Henry Gordon and Marc Lawrence give their customary villain performances. The others vary from passable to painfully inept. Direction and production are routine, befitting the inglorious end of a once-popular series. LOCATION: New York City and Brooklyn, N.Y. ACCORDING TO THE JUDGE, THE PRISON WHERE STEVE MCBIRNEY WAS SCHEDULED TO BE EXECUTED: "...Sing Sing prison..."
ACCORDING TO THE JUDGE, THE DATE SET FOR MCBIRNEY'S EXECUTION: "...during the week of December 9." DR. CREAM'S COLORFUL DESCRIPTION OF STEVE MCBIRNEY: "A little boy from New York's Hell's Kitchen, who went out west and made good in Chicago." THE NUMBER OF BULLETS, ACCORDING TO GRENOCK, THAR STEVE MCBIRNEY "PUMPED INTO" BUTCHER DAGAN: "...thirteen..."
FACTS ABOUT THE SING SING PRISON ELECTRIC CHAIR ON DISPLAY IN DR. CREAM'S MUSEUM, ACCORDING TO DR. CREAM: "Still un use two years ago...109 murderers met death on it." ACCORDING TO CHARLIE CHAN, THE ONLY TIME IN HIS LIFE THAT HE WAS SURPRISED: "Only one occasion...when honorable wife announce arrival of thirteenth offspring." ACCORDING TO INSPECTOR O'MATTHEWS, THE DATE OF STEVE MCBIRNEY'S DRAMATIC ESCAPE FROM THE COURTHOUSE: "Three weeks ago yesterday." CHARLIE CHAN'S COMMENT REGARDING JOE ROCKE: "Innocent man hanged for crime he did not commit." THE TIME THAT CHARLIE CHAN WAS ASKED TO APPEAR AT DR. CREAM'S MUSEUM FOR THE "CRIME LEAGUE" BROADCAST: 8 p.m. THE AIR TIME FOR "THE CRIME LEAGUE": 8:15 p.m. THE TIME OF THE LAW SCHOOL LECTURE THAT JIMMY CHAN WAS SUPPOSED TO ATTEND: 8 p.m. ACCORDING TO CHARLIE CHAN, THE SUBJECT OF THE LECTURE AT JIMMY CHAN'S SCHOOL: "Old Roman law." "The tragedy of the 'Broadway Butterfly'"
"'Jack the Ripper' - London's mystery murderer of the year 1888"
"Henri Desire Landru - 'The Bluebeard of Paris'"
ACCORDING TO TOM AGNEW, THE CASE THAT WAS ORIGINALLY TO HAVE BEEN DISCUSSED ON THE RADIO THAT NIGHT BY "THE CRIME LEAGUE": "I thought we were doing the Bradley Case." THE NUMBER OF THE "CRIME LEAGUE" BROADCASTS AT DR. CREAM'S MUSEUM, AS ANNOUNCED BY TOM AGNEW: "We are gathered for our thirteenth weekly broadcast in Dr. 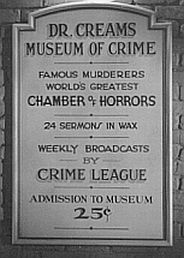 Cream's extraordinary museum of crime." THE TIME GIVEN TO WILLIE FERN BY GRENOCK, POSING AS THE "WARDEN," TO THROW THE POWER SWITCH FOR THE ELECTRIC CHAIR: 8:20 p.m. THE TYPE OF POISON, AS DETERMINED BY CHARLIE CHAN, THAT WAS USED TO KILL PROFESSOR VON BROM: "Tonga poison used by Dyak headhunters in Borneo." ACCORDING TO DR. CREAM, THE HISTORICAL CONTEXT OF THE WIRE CUTTER USED BY LILI LATIMER: "That figured in the Willem Otto murder. It was used by the killer." 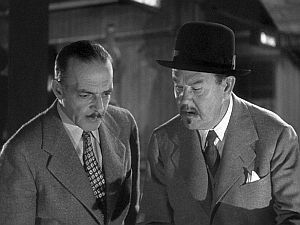 CHARLIE CHAN'S ANALYSIS OF THE "TOOTHPICK" FOUND ON THE TABLE FOLLOWING THE MURDER OF DOCTOR VON BROM: "Hollow toothpick made from goose quill possible blow-gun." ACCORDING TO CHARLIE CHAN, STEVE MCBIRNEY'S "SIGNATURE": "Sheet of paper torn to form string of paper dolls." IN HIS OWN WORDS, THE THREE CLUES THAT LED CHARLIE CHAN TO SUSPECT THAT "BUTCHER" DAGAN WAS THE MURDERER: "Quill toothpick, bamboo dart, and poison called Tonga." ACCORDING TO CHARLIE CHAN, DR. CREAM'S "SIGNATURE": "Five crisscross scars" on the back of the neck of his criminal "patients" "to tighten and alter contour of face skin." TRANSLATION OF JIMMY CHAN'S CHINESE (CANTONESE) DIALOGUE UPON HIS DISCOVERY OF MCBIRNEY'S BODY: "Come here, hurry! There's a dead person here!" 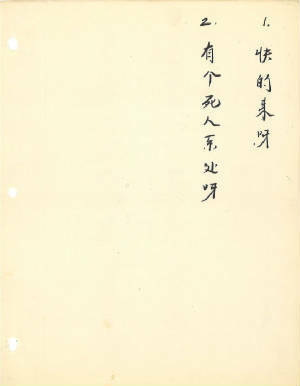 (Below is pictured this bit of dialogue as it appears in Chinese characters on the very first page of the CONTINUITY AND DIALOGUE TAKEN FROM THE SCREEN for "Charlie Chan at the Wax Museum) dated August 6, 1940.
automat - A machine from which food or sandwiches is dispensed. Jimmy Chan: "That's a toothpick from the automat." Dr. Cream: "...why not come back in a month, when this get away has blown over?" Charlie Chan: "But, Degan, true child of Cain, hate him." Grenock: "Get that Chinaman before he gets us." Tour Conductor: "Next stop, Chinatown, the mysterious Orient in the heart of New York." Grenock: "...and won't that copper be surprised." Steve McBirney: "Your evidence sticks me in the death house..."
Steve McBirney: "Hope you never double cross me, Doc." Charlie Chan: "Tonga poison used by Dyak headhunters in Borneo." framing - (Slang) Making up evidence or contrive events so as to falsely incriminate a person. Willie Fern: "...didn't he knock off Butcher Degan for framin' you?" Hell's Kitchen - For decades after the Civil War, Hell's Kitchen on New York City's West Side between 14th and 52nd Streets, and Eighth Avenue and the waterfront, and the Tenderloin just to the east, frequently boiled over with crime and corruption. Notorious gangs ruled the streets between the tenements, grog shops, slaughter houses, railroad yards, and gas works. During prohibition Hell's Kitchen was the domain of Owney Madden and "Mad Dog" Coll who scared even the city's underworld. Dr. Cream: "A little boy from New York's Hell's Kitchen..."
Dr. Cream: "And here we have Henri Désiré Landru - the Bluebeard of Paris." Dr. Cream: "This is Jack the Ripper, London's mystery murderer of the year 1888." Steve McBirney: "Change this map. Fix it so no cop will ever know me." Inspector O'Matthews: "Oh, he'll get five years for lifting mugs' maps." Steve McBirney: "You queer this, and you're both through." shake a leg - (Idiom) To move quickly; hurry up. Tour Conductor: "Shake a leg, folks." Mary Bolton: "What a yarn."